"I received the backdrop last week. I just opened it. I have been very busy at work so I did not get a chance to do so when it arrived. It looks amazing. I wanted to again thank you for all the work you put into this project. It shows to me how much you care about what you do. I just felt you should know this. I will send you some nice photos once I am done with this addition. Again, thank you. "I just thought you might be interested in what I’ve done with one of your Pine Forest backdrops:"
​As you can also see, buildings and building flats can be lifted off to change operations and configurations. I normally glue a few “weeds” around the bases of the buildings themselves to hide seams and make them seem more permanently mounted. For simplicity and utter reliability, I used the standard Atlas snap switches with the manual motors installed…but camouflage the motors. 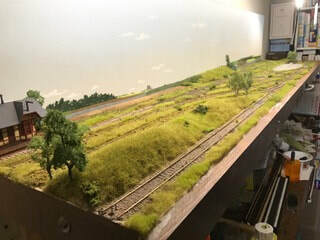 The Pine Forest backdrop literally dropped jaws of multiple professionals I showed my photos to at the Great Model Train Show in Timonium, Maryland this Fall. They couldn’t get over how well the colors matched! So now I can run ANY Northeastern line (and I have many including my own) OR midwestern one. My technique also gives me the opportunity to mount MORE backdrops and use them to change locales and operations with this layout in the future! Thanks for a wonderful product!" " The ... photos are from the 8th annual Bordentown City (NJ) train show. Admission is free, donations go to the restoration of our Old City Hall where the show is located. We start the show the first weekend after Thanksgiving through January 7th. 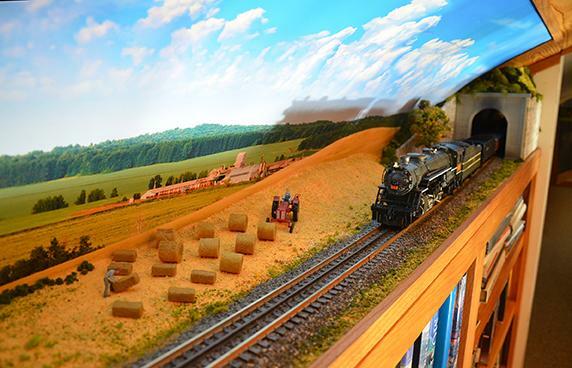 We have up to 7,500 visitors during this time period and many people ask about and admire your backdrop... "
​"Since two of the background murals I used in my model train layout were produced by you, I wanted to drop you a note and show you the final results. 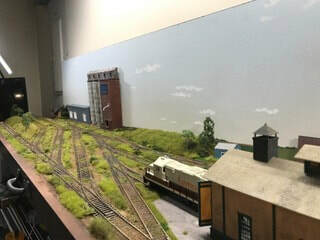 My O-scale model train layout occupies my 8’ deep x 108’ long loft. I’m glad to say everything has worked out well. I wanted to thank you for three things, your quality work, your reasonable prices, and your quick turnaround on orders. Well done!" 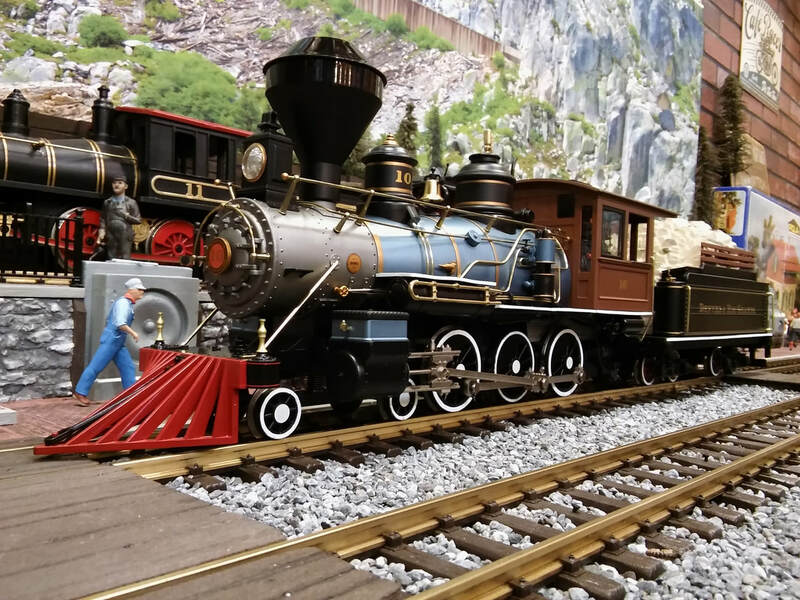 A beautiful model railroad by Mike Doerner. 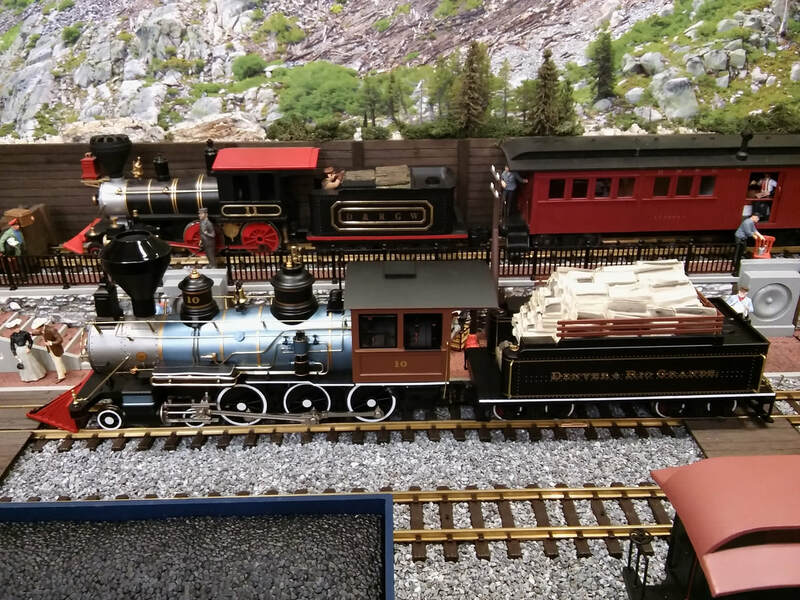 This is done in O-Scale and uses Train Junkie's Donner Pass backdrop.